Dashti isn't your usual fairy tale heroine. She isn't the poor daughter of a woodcarver. And she isn't the third daughter of a king, destined for an arranged marriage based on political gain. No, Dashti is a maid. And her mistress is the third daughter of a king, and her mistress is ordered to marry a man she not only doesn't love, but fears. When the Lady Saren defies her father and refuses to marry Lord Khasar, she and Dashti are bricked into a tower. There they will sit, for seven years, in windowless rooms. Only a small metal flap (to empty the chamber pot) connects them to the outer world. Lady Saren didn't only refuse Lord Khasar due to her fear. She also refused because she is already engaged to another man. And soon, both men come to visit the tower. 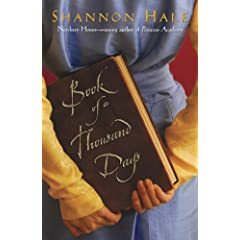 Book of a Thousand Days is Dashti's chronicle of her adventures. I mentioned that Dashti isn't your usual fairy tale/fantasy heroine. Well, she isn't your usual teen novel heroine, either. She's been raised to be obedient and submissive to the ruling class -- to believe that they are more beautiful, more intelligent, more determined and more important than she is. And she acts according to those beliefs, even after seeing much evidence to the contrary. She is empathetic almost to a fault, but as much as I occasionally wanted to see her haul off and slap certain characters, I found her patience and her generosity much more impressive than the usual Fiery Temper that tends to reside in fantasy heroines. Dashti herself is what makes this book special. This one is going to create new Shannon Hale fans. Yes, yes, I know that with each new book the legions grow anyway, but this one is different: It's a fantasy novel that feels more like historical fiction. The magic in it feels more like the magic of legend, and readers who usually Don't Do Fantasy will be more likely to pick it up. Definitely try it on those who enjoyed the earlier Cushman books and on those who liked the Mongolian setting of I Rode a Horse of Milk White Jade. Oh, and it should be noted that the romance was swoon-worthy. And now I'm off to read the Grimm Brothers story this book was based on. Loved this -- I'm counting the days until it comes out. Ooh -- good one. I've been waiting for that one to come out. Shannon Hale is one of my favorite author. i haven't been able to get a hold of this one but i cant wait until i do. Great review. I linked you today in mine here. I like your comparison to historical fiction. You are right it does feel like that and I love the POV. i loved this book soooooooooo much, i read it ten times.